Marriot Kauai is a fantastic option on the mid level price range but with excellent service and amenities. Highly suggest renting a car. The island isn't that big but there is a lot to see and if you aren't booking tours for everything, its great to have a car. Waimea Canyon is spectacular and breathtaking. Money well spent to do a helicopter tour but a regular tour is great as well. Drive the Na Pali Coast. Bring hiking or tennis shoes if you plan to hike. Its not something you can do in flip flops. Hike the Kalalau Trail. Its intense but the views are so worth it! Visit the Kauai Coffee company plantation and bring back some coffee, its delicious! Hike anywhere and everywhere, the nature and beauty of this island is absolutely magical. In my 20's running marathons were my jam. I had good knees then. I can't say the same for now, but now I just run half marathons. By picking Kauai to run a marathon, I could cross two things off my list; running my 5th marathon and getting a vacation at the same time. Done. I convinced JP to run the marathon with me and so off we went to Kauai. The marathon is in September and its a beautiful time of the year to visit Kauai. Really though, anytime of the year is great to visit. We stayed in a beautiful villa at the Marriott Kauai Beach Club in Lihue, Kauai. Designed in the style of a royal Hawaiian estate, the resort sits along Kalapaki Beach, and is set up as more of a condo than a hotel. Washer and dryers are in unit as well as a full kitchen and dining room setup. The hotel grounds are perfectly manicured and the staff are friendly and very accommodating. The view from our patio was picture perfect and we were thrilled to wake up to that daily. The best part of this Marriott was the location, it was central. If we wanted to go North or South to explore, we always ended up coming back to the middle, home base. We stayed for over a week so it was great for us to be able to feel like we were "home". We did a helicopter tour of Waimea Canyon and it was breathtaking. The canyons, the mountains, it all was absolutely gorgeous. There is the Pu'u Hinahina Lookout that provides another dramatic option to view the Waimea Canyon. From the lookout, you can see all the way to the Pacific Ocean! The canyon is 10 miles long, one mile wide and 3,500 feet deep. My palms were sweating like crazy in that helicopter! 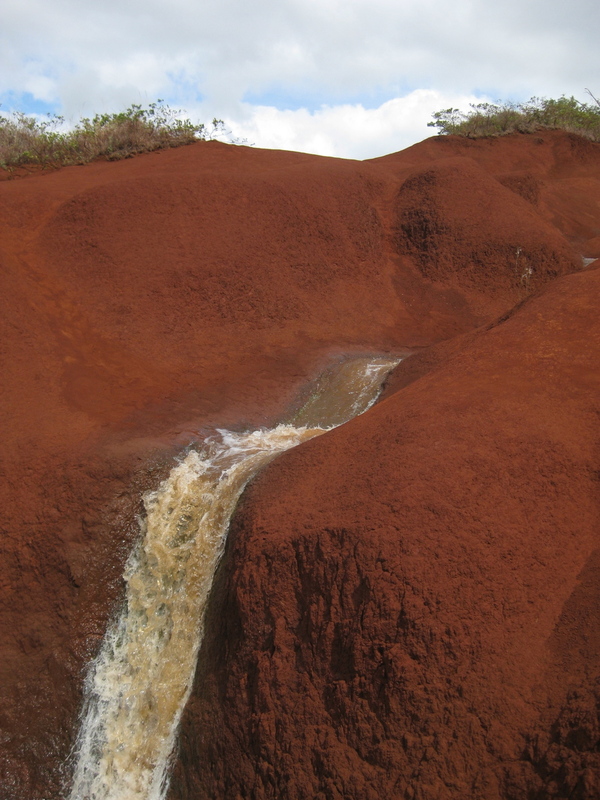 Randomly we found what they call "Red Dirt Waterfall" on the road to Waimea Canyon. Its not really a waterfall, more like a steam (depending on rainfall) that runs along the dirt mounts along Waimea Canyon Road. The dirt is naturally a deep red color, and its fascinating to see mounts and mounts of it! They said if you rub it on your skin, the color absorbs in and its like a natural tan! I didn't try it because I am tan enough, but we did try it on JP, ha! Highly suggest this hike, its one of the best hikes I have ever done, in the world! If you can, try to start your hike on the earlier side, like 9am, because the sun does get quite intense. Bring water, a hat, lots of sunscreen and some snacks. I'd like to think I am fairly athletic, but I must warn you that this hike is intense. The hike to the beach takes about 2 hours and you must wear tennis shoes. At some points it get pretty rocky and the likelihood of getting a twisted ankle is pretty high, so be careful here. Some points of the trail are really narrow and only allow for one person to walk at a time, so if people are going in different directions, you will need to take turns. At the .25 marker, there is a spot to rest and take in the views. You will look down and see the Na Pali Coast and Ke'e Beach and possibly some humpback whales. Once you reach Hanakapiai Beach, I suggest going another 2 miles (if you can make it!) 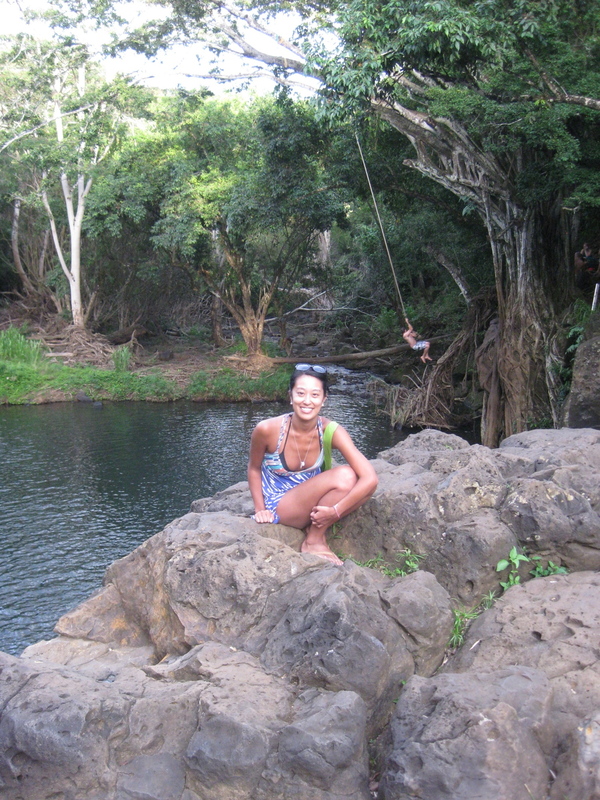 to Hanakapiai Falls. The entire hike you're walking under a canopy of lush green and a forest of bamboo, pass by a beach full of balanced rocks and finally get to a giant waterfall. What better reward than that? Many injuries and lawsuits have officially have caused the property owner to officially blocked access to the waterfall. I am so happy we got a chance to jump and swing before it was closed. It was an incredible hidden gem. A Banyan tree had a rope tied to it for people to use to swing off into the water. I laugh every time I look at the photos below because in the background of the photo, JP is in the back playing Tarzan, LOL. 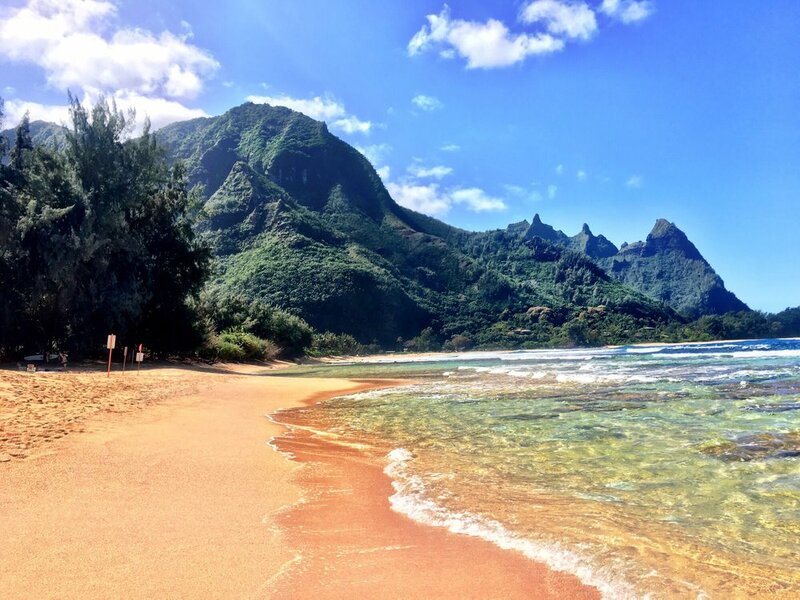 Located on the North Shore of Kauai, Hanalei Bay offers something for everyone with its soft white sand and majestic mountain backdrop. Experienced surfers as well as paddle boarders share this beach and since its not wildly crowded, its perfect for a romantic quiet getaway. 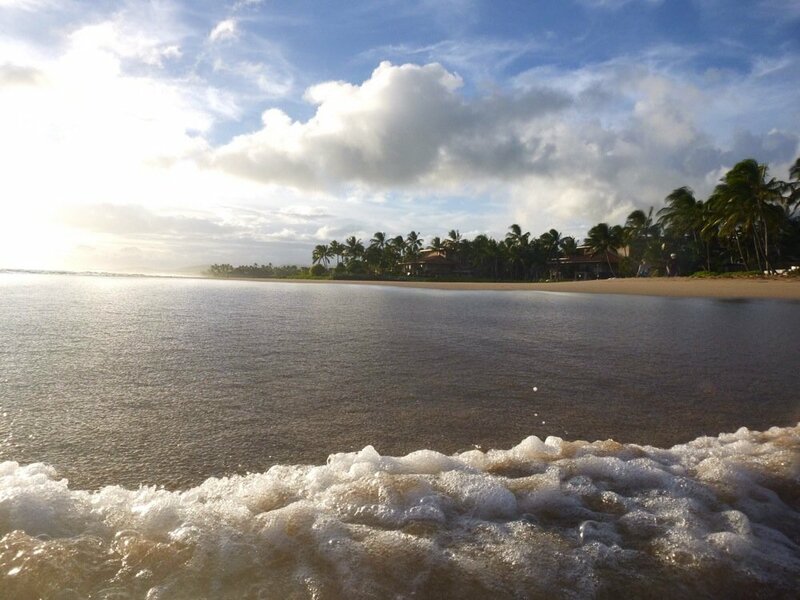 This North Shore beach is known for its half moon shaped reef which is the ideal place for snorkeling! 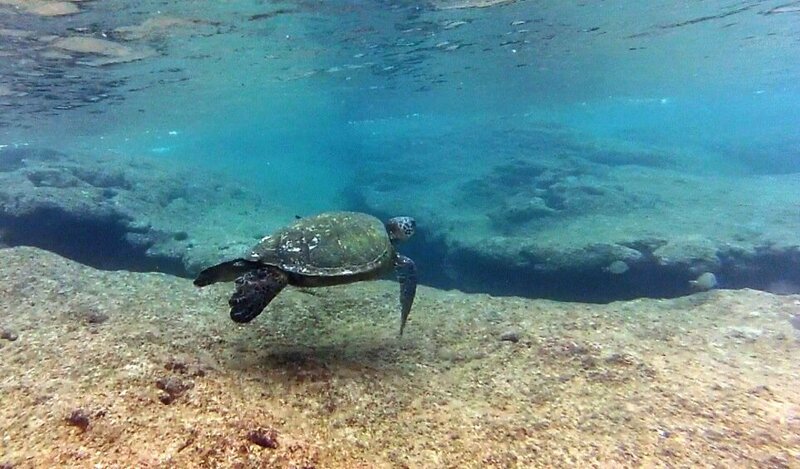 The water is crystal clear so you are bound to see tons of animals swimming, I spotted a sea turtle! The Hawaiian Monk Seals come up to the shore, so give them space and don't crowd them, as tempting as it may be! Another amazing beach with excellent snorkeling and calm waters. Can't go wrong here. Seals, turtles, fish, you name it, you will probably see it here. Its much more crowded than the other two beaches I mentioned above. If you're going to run a marathon, at least have it be in a stunningly beautiful place that you can enjoy nature while running 26.2 miles! 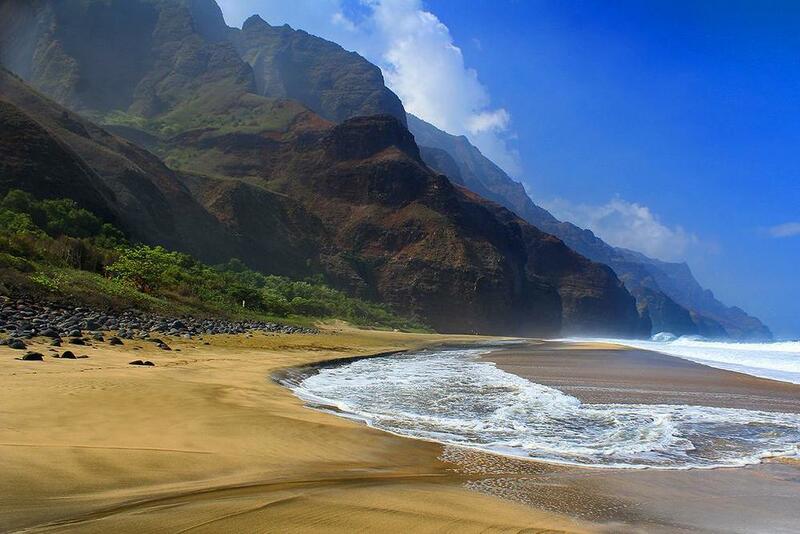 What better place than the paradise of Kauai. The course follows the contour of the scenic coastline boasting magnificent views of the island's iconic beaches and palm trees, rugged volcanic peaks and green tropical rain forests. The run does consist of a lot of hills (just like the San Francisco marathon which I also ran! ), which can be tough on your knees. The marathon ends in Poipu beach with a medal and complementary massages. Sorry I don't have any images of me running, I was too busy soaking in the beauty of my surroundings! If you're a marathoner, consider this destination for your next run. Let me know if you have done any races in other beautiful destinations that I should put on my list.